I have been slowly, but surely working on the mandala that I began at the Summer Solstice Mandala Retreat Day. I am almost complete, but not quite. I am just waiting for inspiration to know where to go next to bring it to completion. This is far as I have gotten. The summer feel comes through strongly. It feels like it needs something more...but what....I will wait until I get a sense of direction before I add anything else. This past sunday, we facilitated another Illuminated Mandala Retreat Day. Both Patricia Waters and myself, are facilitators of Judith Cornell's Illuminated Mandala Process. For the Summer Time Mandala Retreat Day, which we held up at Mountain Home Ranch in Calistoga. We focused on Angeles Arriens Five Universal Shapes... which are the circle, square, triangle, equal distant cross and the spiral. If you don't know about her work please check out her website. What amazing work everyone did. Here are some photos of the days process work. Preferential Diagnostic Tool, you can find it in her book "The Signs of Life". Although most participants didn't complete their mandalas at days end, since it is a slow and meditative process, they were all stunning . I have posted a few of them to just give a taste of their power and integrity. We will do these retreat days around the solstice and equinox, as well at the begining of the year. Our Fall Mandala Retreat day will be on September 22. See our website for more information. Now I have a mandala to while away the summer time hours, with slow meditative drawing....which I just love to do. I will post my mandala's process in the days to come. Enjoy the Summer!! Now that I have finished the all consuming Art at the Source Open Studio Tours....I can finally relax. I often wonder about what to post here. I am not one for idle chit chat on line. So here are two encaustic mixed media paintings that I have recently done. Once I rest up and get some luxurious reading done, swimming, walking and catching up on details both mundane and important...I will try to get back to my encaustic work. In the meantime, I just bought a new digital camera...a Nikon Cool Pix s550. Oh, I am so excited that all night long I dreamed about the photos I am going to take.. I am finally rested after the first weekend of the Art at the Source Open Studio Tour. It was exciting to have people come see and respond to my art, but the set up and prelude to getting it all together was rather exhausting. Many old friends and new, past students, art therapy colleagues and wandering art lovers and seekers, came through during the weekend. The experience was exhilerating and inspiring. 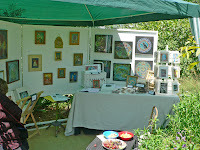 And although the economy is slow, I did make some sales the first weekend and got lots of positive responses to my work.